Congratulations, Browns fans. Your undying devotion to a team that has won five games since 2015 and hasn’t been a Super Bowl contender in 30 years has paid off. I would say it's more idiotic to support a franchise that loses better than everyoney else. Worst call in the history of the NFL. The fans were wrong but Terry McAulay was wrong too. and the reason why we cannot get drinks with caps on anymore. Just curious. Where did the Bengals' fans rank? Bad calls happen ALL the time. It is part of the game, even with replay. What is not part of the game is officials making up new rules. Not the NFL, but the simultaneous possession call in the 2017 OSU-Penn State game was criminal. I dont know the more I think about it, that play probably was the worst call that I can remember. They did blatantly ignore the rule. Has that ever happened since? Last edited by Arrogate; 12-06-18 at 11:42 PM. I dont know the more I think about it that probably was the worst call that I can remember. They did blatantly ignore the rule. Has that ever happened since? I hate these click bait sites. Was going to see where Star Wars and other movies ended up. Last edited by Arrogate; 12-06-18 at 11:43 PM. You seen Denny Bryant stadium for games that aren't primetime against a highly ranked SEC team? They only list 250 total. #208 was the Jags (18th best fan base) no NFL teams listed after that. Yeah, bad calls do happen. Just look at the original call on that 4th down play where they ruled it a catch. At least they got it right in the end. Hence why it's ridiculous to call it the worst call in NFL history. Like this poll comes as a shock? Did you leave your wife when she got fat? They didn't get it right. Can't review a play after the next play. It's interesting that the argument is the officials can make up rules to correct mistakes earlier in the game. The paramount rule of the instant replay system (compared to the first version years ago), was that no plays can be run that 'won't count'. The NHL problem. So, if the NFL replay official couldn't signal the officials, OR the system was down, etc, then the play stands as called. Even if wrong. This was to ensure the game wasn't bogged down with waiting or officials to declare a play good, and to make sure to avoid another play gets negated going back to change a previous play's call. 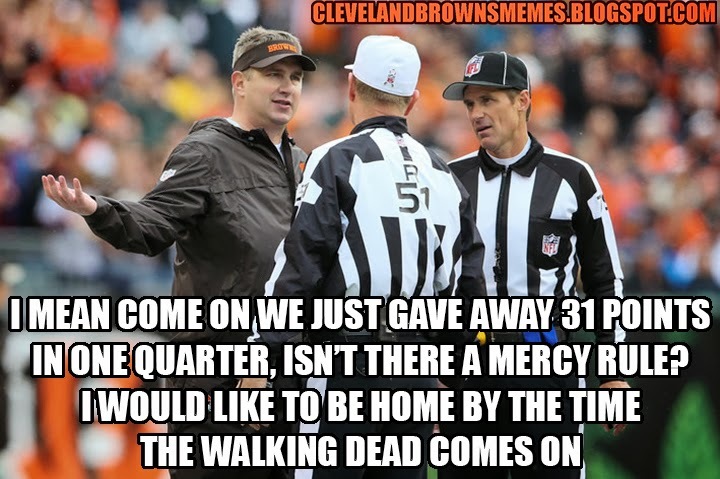 What if the Browns scored the winning TD on that next play? Would you be comfortable calling it back and say we're going to review a previous play? A missed call is a missed call. It happens. Changing the rules as you go, is not the way to correct it. Imagine an official misses a holding call, and then after the next play is ran decides to throw the flag and call the penalty.... is that okay? Last edited by Sykotyk; 12-12-18 at 03:06 AM.